Duwa´a,2 & Schahd,5 al-Sarchan,Father Hassan 30, 5 children, worked as taxi driver betweeen Amman and Damascus. 13, April 2013 11am a rocket hit the 4. floor of the house of his uncle where they lived. They had moved there after their home came under control of the Syrian army. As soon as the Syrian army moved in all people left.He was in the third floor when the rocket hit the balkony than through three walls and injured the daughters badly in the bathroom were they played. 22 rockets were shot in less than an hour. The day before the FSA captured a nearby checkpoint (700m) and killed all the soldiers. Hassan takes Schahd with the notorbke to a nearby field clinic of the FSA with the motorbike of his uncle. She has a big shrapnelwound on the knee. He doesn´t know anything about Duwa´a fate than. She is brought by car to the same clinic. Her lower leg is cut of by the shrapnel and the stump is sewn. Two days after she is brought to Rantha from there to al-Jasira Hospital in Amman.A transplant is made for the stump. The prosthesis was provided by MSF, they will also make the next operation. 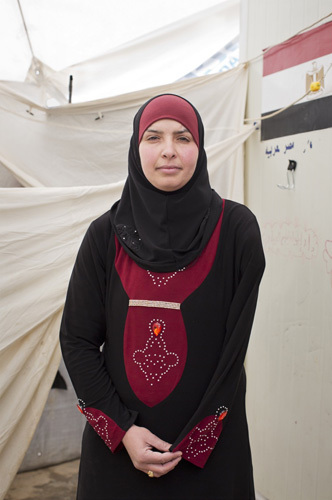 Schahd 1,5 spent month, Duwa´a 3 month in the clinic of Syria Cross Borders. Hassan visited the girls once a week as transport is too expensive for their budget.Now they wait for the next operation. After they want to go back to Dera´a. The 125 JD for rent is from his father. Two of Hassan´s brothers were arrested and there are no news for 1,5 years. He was arrested for 5days and his car was torched by the Syrian custoums authorities. The oldest child can´t go to school too far. Amman, Jordan, 2014. A´amar Yassir Salamat, 8from al-Harak in Dera´a province. He was injured on 24, July 2012 when a rocket hit a shelter with hunderds of people from the side. 6 children and a woman were killed in the incident, 10 were injured. His arm and half his foot were severed by the explosion. He spent a week in a field hospital. Than he was carried across the border on a strecher for 5km. In Jordan he was amputated twice because of an infection which occured already in Syria because of lack of any antibiotics. He spent 2 months in the Islamic Hospital in Amman. Than a French organisation brought him to Paris where his stump was cleaned and a further operation was done on his legbone. He received a prothesis in France which works very well the one he received in Jordan from Handicapped International was inefficient. The whole family is in Jordan. A´amars aunt two sons were executed by the regime, one was hanged (picture). Her daughter Rukia, 13 lost an arm in the same incident. Her husband is in prison and haven´t been heard of since 2years. A sister of A´amar died of leucemia. She couldn´t go to Damascus for chemio therapy for 4 months because Assad troops besieged al-Harak. Irbid, Jordan, 2014. Raya Mohamad, 63from Basr al-Harir in Dera´a province. On 5, January 2012 she was injured by an artillery granate shortly before evening prayer. She was about to wash herself for prayer when the shell hit the watertank on top of the house. She received shrapnel in her face, legs and her lower arm was shattered as well.She was brought to a field clinic of the FSA and than transported with an ambulance to Zaatari camp in Jordan where she was operated in the French military hospital. Than she was in a hospital in Al-Dalil were MSF examined her. She underwent than three operations with MSF, metal plates were removed from the bone, a bone & a nerve transplant was done and a stabilisator implanted. Her last operation was in January. She works as house wife but also farms and takes cares of animals. She has four girls and four boys but she was the only one to get injured. A daughter accompanied her to Jordan the rest of the family is in Syria. The village gets regulary shelled and bombed by aircraft. The village was first occupied by government troops but they had to withdraw to a nearby army camp. One nephew was arrested three years ago and was not heard of since. There were a lot of casulties in the village. Amman, Jordan, 2014. 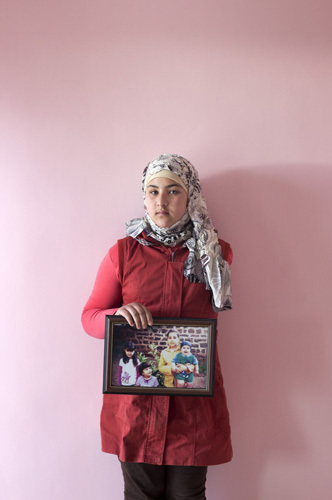 Iman Khalid Refaie, 11a schoolgirl in the 5th class from Yabroud, rural Damascus. 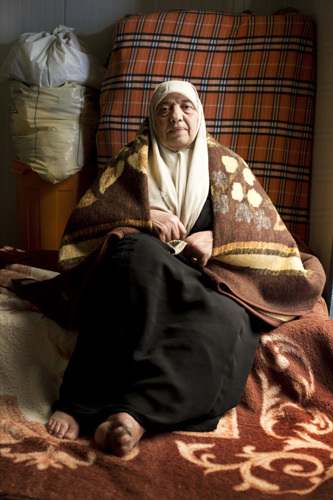 She fled with her family of 17 people to the town of Arsal in Lebanon on 15, February 2014. There they rented a house. In August 2014 she was injured in fighting between the Lebanese army and fighters of the Nusra Front a Syrian radical Islamist group. Because of shelling they left a higher floor to find more safety in the ground floor but she went up with her sister again to grab some of her belongings. At that very moment a shell hit and shrapnel hit her arm, hip and stomach. Her sister was injured too. Luckywise her uncle a doctor from Germany was visiting them for the feast at the end of Ramadan and he treated her immediatly. When the shelling abated they brought her to a hospital in Arsal by car. There she was operated by a team of doctors including her uncle. From there she was transfered by the Red Cross which payed for all the treatment to the Government hospital in Baalbek. There she stayed for a week, after she was treated for one week in Shifa Hospital in Tripoli. The family rented a flat with three rooms for 400$ where they live in the moment. Her uncle will bring Iman, her sister and brothers, parents and grand parents to Germany in the next couple of months. The grandfather is suffering from palsy because of age. Majdal Anjar, Beka´a, December 2014. Manal Nasr Saleem, 10from Taseel village in Dera´a province was injured about a year before the photograph, she can´t remember exactly. She, her family and relatives were sitting in the garden of her house when a granate hit the watertank of the house. She was hit by shrapnel in the leg, hand and head. Her mother and aunt were injured too. She was brought to a field hospital and amputated above the knee. After 15days she was transfered to Ramtha hospital in Jordan were she stayed with her mother for two months. She was operated on her hand there, the leg stayed as it was. There were no further operation done on it in Jordan. She was transfered to three hospitals before she was treated by MSF. After three MSF operations the movement and feeling in her hand is decent. Before her hand was very often cramping. She gets physiotherapy every day. She is attending school in Jordan but lost 6 months because of her injuries. She will need one more operation in about 3 months time. Her prothesis she received from Handicapped International and can walk very well with it. She has two brothers. Amman, Jordan, 2014. Sharif al-A´asmi, 13from Da´al in Dera´a province. 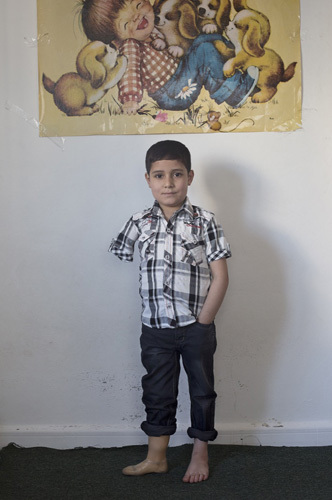 He was injured on 8, May 2013 when a barrel bomb hit his house. His grand parents died, his mother lost her lower leg, two of his sister were injured and also his brother. The two story house was destroyed completely besides of three people the whole family was outside. Sharif saw the helicopter dropping the bomb. The town had been quiet for three days when the helicopter appeared. Sharif has shrapnel in the head and needs more surgery on that as well as in the arms and legs.He was transfered straight to the King Abdallah hospital in Jordan because of his very bad condition. He spent four months in hospitals and had seven operations. He was now transfered to a rehab center of MSF. Next week he will undergo an operation with MSF. He will need further operation especially for his elbow and will need many physiotherapy sessions. He couldn´t attend school since the bombing. His father worked in the VAR and will go back there to earn money. All his savings he has spent now also what he recieved from friends and relatives. Irbid, Jordan, 2014. Iman Machmoud Al- Refaie, 38she was injured at 8pm on 29, November 2012 by a sharp shooter of the Syrian army in the driveway of her house in Atman 3 km north of Dera´a. She was sitting in a car with her husband Basam, 43 a taxidriver and one of her six children. They were returning from a visit of her brother. There was no fighting in the village at that time. She was hit in the spinal cord with one single bullet which hit the car from the back. The sniper shot from an air defence base which is 500m away from Iman´s house. The base was captured by the Free Syrian Army (FSA) in late 2014 and the sniper was captured and is now in custody of the FSA. The village of 14 000 people is completely depopulated in the meantime. Her house was badly damage in the struggle for the base. As they were living in a government controlled area her husband Basam drove her to the government hospital but they received no help there. So Basam went to the rebels who transported her immediately cross the border to Ramtha in Jordan together with her son Majid, 15 than. She was transfered the same day to the Islamic Hospital in Amman where the bullet was removed from the spine, the wound cleaned and a colostomy was layed. 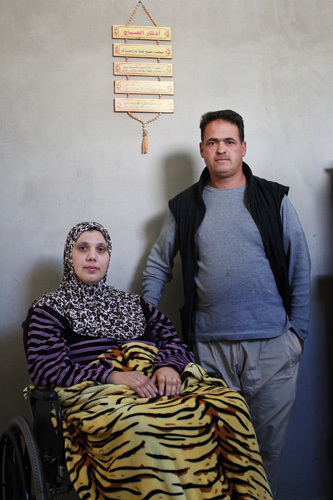 Her husband arrived in Amman a day before the operation, Iman had to stay in the hospital for two months. Than they moved to house which they rented for 200JD in Ramtha. The rent they mostly borrow from friends and relatives. They are three months behind with the payments. They receive food voucher from the UNHCR for 18$ (13JD) a month till autumn 2014 they received 33$ (24JD) per person. Occassionally they received help from Islamic charities as mattrasses or dates. Iman is in constant fear that her husband will leave her though is no intension to do so. The daily physiotherapy for Iman is hard work for the family.Ramtha, Jordan, February 2015. Rukeia Salamat, 13 from al-Harak in Dera´a province. She was injured on 24, July 2012 when a rocket hit a shelter with hunderds of people from the side. Her three siblings the one year old Maria, Asma, 4 and Henet, 8 and another three children and a woman were killed in the explosion, 10 were injured. Her arm had to be amputated and her mother lost her lower leg. She spent a five days in a field clinic where she was operated once. Than he was carried across the border to Jordan. She spent two and a half months in the Islamic Hospital in Amman with her mother in the same room. She had another three operations there and was release together with her mother. Since a year she is back in school which she was also attending during the war in Syria. Her father was hairdresser before the revolution and managed to continue to work in Lebanon during the war but now he can´t go back. Refugees are not allowed to work in Jordan. They are registered with the UNHCR and receive food coupons for their appartment they have to pay 250Euro rent.Her mother received a prothesis from Handicapped International. Irbid, Jordan, 2014. Achmed Masalameh, 53 from Dera´a center.He was injured on 26, April 2013 while being on his way home after Friday prayers. It was a quiet day and the rocket come out of nowhere. He was transported to a provisional clinic (2 roooms) and transfered later to Aqil Hospital in Jordan. He was injured in the chest and lost two fingers on the right hand. His left lower arm was shattered. He had a stabiliser which was removed and metal plates keep now the bones togehter. There is no feeling in the left hand though there were operations on the nerves although plastical surgery was done.He received three months of physiotherapy in Taqaful Society but needs another six months after the last operation is done.All operations were payed by Islamic charities.His family fled already to Jordan one and a half months before the incident as his grocery shop and house are in government controlled area. He has triplets and lives with his mother and wife in a flat for 170JD. He is registered with the UNHCR and receives food coupons from them. The rent he borrows from friends after his savings are all spent.Ramtha, Jordan, May 2014. Ali Abdel Mahamid, 26 from Dera´a province Um al-Mayadan.He is married has one child and his wife is pregnant.Before the revolution he worked as a construction worker. He fled Syria but as refugees are not allowed to work in Jordan, he couldn´t make a living and went back to Syria. On 18, March 2014 he was shot at the front porch of his house by a Syrian army sniper from a checkpoint which is roughly 800m away. The house was damage before as it sits inbetween the two waring factions.He was hit in the spine and brought to a local provisional clinic in Nasib village. They transfered him immediatly to Ramtha in Jordan and than on to the Maqased al-Hairi Hospital in Amman. There the bullet was removed and he stayed there for 20days. He was than brought to Zaatari Camp where he stayed with Doctors Without Borders for 4days without treatment than he was sent back to Maqased al-Hairi Hospital from which is was tranfered to Ramtha. At the Taqaful Society he was operated on again and has to receive physio therapy for at least a year. He lives with his family and mother in a flat which costs 150Euro plus running costs.He received a wheelchair from Handicapped International but needs badly a bed. Otherwise he has received no help. Ramtha, Jordn, May 2014. 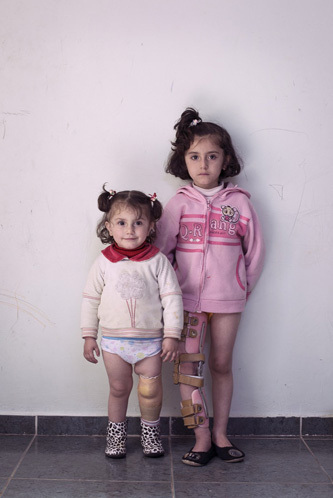 Hamoude, 6 & Amani, 9from a village next to Homs. Her father is a farmer and has four children left. In July 2011 the village was shelled because of demostrations after Friday prayer. They run downstair to the groundfloor as it was considered safer. The shelling stop and they went up to the secound floor when the grenades started falling again. Their apartment was hit and her mother and a nine month old baby died immediately. Hamoude´s head was full of srapnel and it had to be sewn with about 80 stiches. His arms and body were full of shrapnel as well. His arm and leg were put in cast. Two fingers of his right hand don´t work any more. His left leg shows signs of palsy, cramps and while walking his foot stands up. He is in need for operations and physiotherapy to fix that. Amani´s body received a lot of splitters too which and still cases her a lot of pain. Her heel was almost cut off. They were treated on and off for one and half a year in a provisional hospital. The father brought them to the hospital very other day. All operations on the siblings were done without anestetics. The father is very exausted and married again a cousin. His income he spent on buying medicine for the siblings. On 5, July 2014 he fled to Libanon before selling all his property. They are registered at the UNHCR and receive food coupons. The DRC provided the with blankets and matrazes. The 200$ for rent they get from charities or take loans from realtives. The children are not going to school though it is free but they can´t afford the transport to the neighbouring village. Amani is also still in need for an operation but they don´t have the 700$ for it. Handicapped International came for two months every week to provide physiotherapy and tought them how to do it by themselves. Now HI comes only once a month. Deir Amar, Tripolis. December 2014. Alia 48, Dia´a 23, al-Misri and Heba Abdel Salan 21 (Alia is her aunt)They are from Haidt in Dera´a province. The two women were injured when an artillery shell fell on their house on 13, April 2013. Ibrahim, 50 the husband of Alia died on his wounds after the explosion. Alia was amputated. 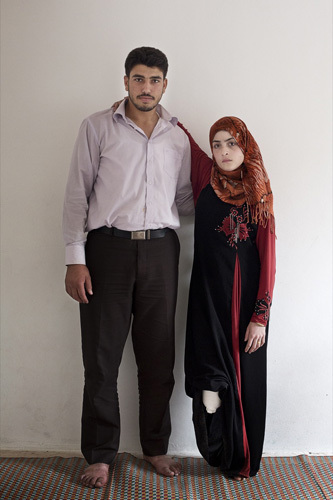 Heba was pregnant in the ninth month when she was injured. She was three days conscienceless and lost her child during birth in Jordan where she was brought to immediatly. Her legbone became infected and parts of it had to be removed. She is wearing now a metal chage to grew the new bone for four month and has another three months with it. She also has shrapnel in the knee and chest. The operations were paid by a Kuwaiti organisation.Dia´a was injured by several bullets in the leg on 13, December 2013. 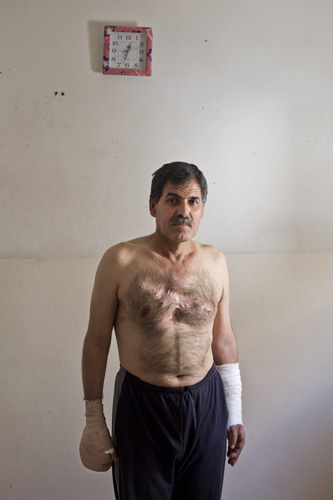 He was trandfered to Jordan where he was operated by MSF eight times. He needs one more and a bone transplant but this is too expensive and he is waiting for a donation to fund it. He worked as trader before. The whole family lives now in Jordan. Food they receive via UN coupons. Ramtha, Jordan, 2014. Qusai Masalameh, 11 from Dera´a center. 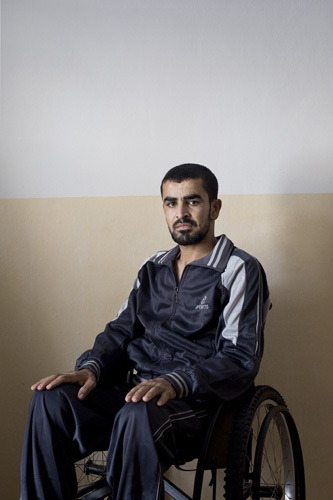 His father Baschir owned a car wash which was between two secret service buildings and was destroyed at the start of the revolution.Qusai was injured by a Syrian Army sniper on 3,Dez 2012 in front of his house on a quiet day. A neighbour (Bassem Bajmug, 18) who try to rescue him was shot in the head and died. Than Free Syrian fighters came and took the sinper´s position under fire so Qusai could be rescued. The sniper had shot 3 people in 15 minutes.Qusai was first transported into a local field clinic than in the government hospital in Dera´a from where he was brought to Damascus.Later he was driven to Amman. There was one operation to remove two blood clots. The bullet damaged the 7&8 vertebra and the nerves attached to it. The feeling in the leg comes and goes.He is doing physiotherapy since 15 months. 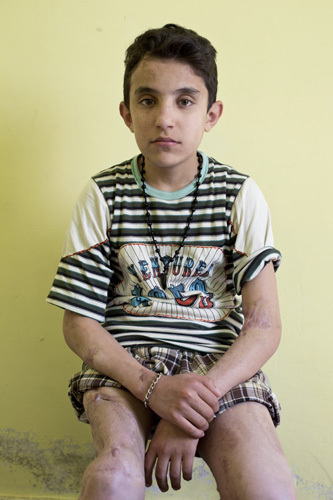 Qusai and his brother don´t attend school.The prostetics cost 1500Euro and were donated by a Palestinian. Qusai´s family lives in Jordan now since 17months and pays 150JD for their little flat.The medical report of Qusai were sent to Canada, France, Germany, Holland and the US but there was no response. He had another operation two months ago which improved his feeling in the legs a bit. Irbid, Jordan, May 2014. 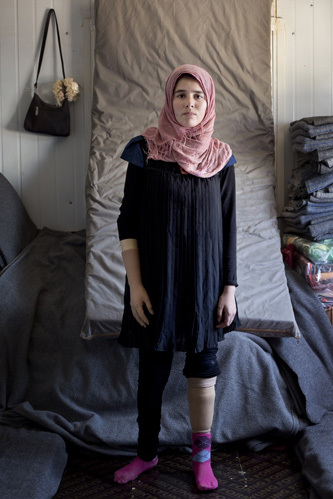 Fatemah Hariri, 17from Harak village in Dera´a provice. She was injured on 16, October 2013 by an artillery shell when she was at home with her husband. The house was destroyed. They had married a month before. Her aunt was injured too in hand and foot. Fatemah was treated in the local provsional clinic and than transfered to the government hospital in Ramtha/Jordan. There she stayed there for 3 days and was than brought to Dleil Hospital in al-Mafraq where she stayed for one and a half months. She had a couple of operations but can´t remember how many exactly. She is amputaedbelow the knee and under the elbow. Her prothesis for the leg works well, the arm prothesis is useless. She received them both from Handicapped International.Since five months she lives now in Zaatari Refugee Camp with her siblings, mother and father, a worker all together they are eight. Her husband left Syria and moved to Lebanon for work. He got there by bribing the army as he has to do his national service but in the meantime he lost his job in Lebanon and can not bribe the army anymore to go back to Syria and than to Jordan so he is stranded in Lebanon and they are separated. Zaatari Refugee Camp, Jordan, May 2014. Mohammed al-Aisha, 16 from Dera´a refugee camp. 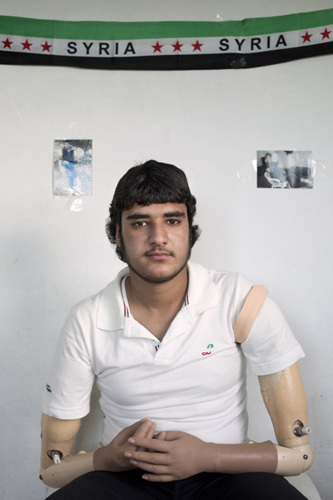 He was injured on 4, November 2012 by a heavy machine of a battle tank during fighting in the refugee camp. It houses refugees who were driven out of the Golan Hights by th Israelis in 1967.After being hit in the lower left leg, he was brought to the local FSA clinic where the bleeding was stopped. He was also amputated there immediatly and got a transfusion. Mohammed was than transfered to Zaatari refugee camp in Jordan where he only stayed for half an hour before being brought to the Islamic Hospital in Amman. There he stayed for 27days and was operated three times. After being released from Hospital he lived with his mother, Brother and sister in Amman for six months. Than they returned to his father who is still in Dera´a working as a doctor in a makeshift clinic.Eight month later he went to Amman and received a prosthesis there by Ibn Sina Center. It was payed for by a Qatari person and works very well. The physiotherapy was provided by Doctors Without Borders for a month. Since a month he is living now outside Ramtha with mother, brother and sister. Their rent is 70JD but the transport into town makes it more expensive. The last time he went to school was in October 2012, his mother used to work in a kindergarden. They receive food coupons from the UNHCR for 25Euro per person a month. Ramtha, Jordan, May 2014. Salam Hjaje, 10from Harbat al-Ghazala in Dera´a province. 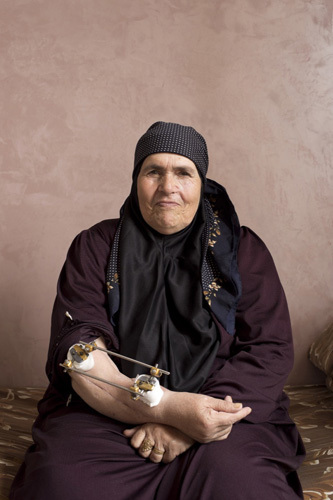 She was injured in the very first artillery barrage on her village on 1, July 2012, her legs were cut off in the explosion. Her 13year old sister Falka got srapnel into her head. Salam was operated at the local provisional clinic where she stayed for two months, her sister died after 16days in comma. Than Salam and her family flew to Zaatari refugee camp in Jordan and from there to the village of Jeidea where they live since. 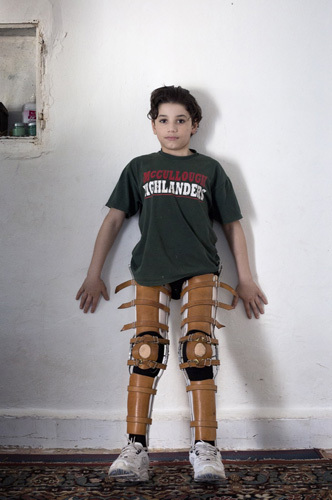 Salam was brought to the Tahasusi Hospital in Amman where she operated again mostly sharpnel was removed but she still has some in legs, arms and face.A year later she traveled to France where she received prothesis but they are not very good so her father bought her kneepads and she can move around with it pretty well. Once back in Jordan she had another operation in the Emirate Field Hospital in al-Mafraq. She went one month to school in the village but than dropped out. Her father worked before the war as a construction worker abroad in South Africa, Libya ct. He came back a year after the revolution had started. The family receives food coupons from the UNHCR and the father works occasionally though it is forbidden to pay the 100Euros of rent for the house. Jeidea village, Jordan, May 2014. Hadija al-Jama´a, 41 lawyerfrom Steida A´artus next to Moadamyeh outside of Damascus.She studied law in Damascus, worked nine years as a lawyer and is married. She was injured in August 2011. There was an explosion next to her car when she was driving towards Daraya neighborhood in Damascus to see a client. She can´t remember what happened. For one week she was in a comma in a hospital in Damascus. She received 14l of blood in the start and was operated three times. She spent four months in hospital and received a metal stabilizer on her upper arm to heal the bone. She has very little movement in her fingers overwise her arm is immobile. When it is cold she has pain in the arm. After being release from the hospital she went offically to Jordan in hope for better treatment. MSF removed the metal stabilizer and she received some physiothearpy but this was stopped as it was too costily. She is supported by a private person who pays for her rented appartement where she lives since her arrival in Jordan. She is helped by her sister. Seven times she visited foreign embassies to seek for treatment abroad but was rejected. Her wider family is still in Syria, one cousine was killed and two other relatives are in prison. There are no news from them. Amman, Jordan, 2014. Khaled Nasr Achmed, 17from Al-Gharia al-Gharbia near Dera´a. He has 4 sisters and 4 brothers. He got injured on 26, May 2013 around noon when a rocket hit their house while the family was having lunch. His mother who sat to the right of him is killed instantly, two of the sisters are injurded in the neck and head. His fathers left ear is deaf because of the explosion. Khaled still has 6 fragments in his body. Another rocket hit outside the house. Their village was shelled for 3 months and the army come twice to the village (15000people) arrested people and left after.He was brought to a FSA hospital were he spend 4 days than he was transfered to Ramtha in Jordan. Than he was transfered to the NGO Syria Cross The Borders were he stay a month. His prothesis he received from Markas Abu Nastaa?. It was payed for by a Kuwaiti woman who they meet in Facebook. She came and they met in Irbid. The prothesis are too heavy and don´t work well. He needs a electronic one from France but they will cost around 25 000Euro. A German doctor (Omar Said) inquired but never answered again after he had collected all information from Achmed. They talked to a lot of organisations for help but with no result. The whole family is in in Jordan now. He work in a clothing shop before which belonged to a friend. They pay now 250JD rent and have big problems to raise the money and have moved five times till arriving in Jordan. They receive some money from an uncle in the gulf and food coupons from the UN. They are also registered with an Islamic charity but received only blankets and some matresses from them.They would need somebody who takes care of Achmed. Mughreir village, Jordan, 2014. Jumna, 6 & Aid Muqbil,8 from Tel al-Shaab in Dera´a province. Their father is Mohammed Aid Muqbil, 40 an agricultural worker. On 21, February 2014 a helicopter dropped four barrel bombs only one exploded but on the house of the family. The mother Fatima, 35 was killed also the father´s brother Abed, 47.The father was also injured in th hip, Jumna lost one lower leg, Aid lost both.They were only bandaged and immediately tranfered to Amman as the border is only 12km away and finally operated in Dleil Hopital next to Mafraq. Now they are in the rehabiliation center of Suria-abr-al-Hudud (Syria Cross Borders) a Syrian NGO.The village was attacked three times though there is no FSA there. The area is under siege so nobody could work since two years in agriculture. More than half of the population fled. Some injured in the village were received by the Israeli army and treated in Isrealis hospitals and after being cured were returned to Syria. The father Mohammed shows signs of malhidration. His father fled from the now occupied Golan Hights in 1967. Amman, Jordan, April 2014. Ibrahim Hasin, 8from Sauwran village north of Aleppo. 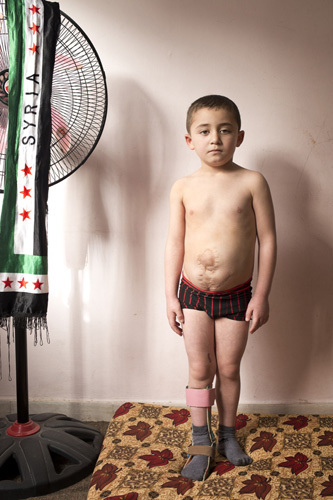 Ibrahim was injured on Christmas Day 2013 at around 9am when a shell hit his house. A stove he was sleeping next to was blown over by the grenade. The village is caught in fighting between the Islamic State and Syrian rebel groups. He was badly burned in the face and leg. He was transfered by ambulance to a hospital in Gaziantep / Turkey. His parents crossed the border by foot as they didn´t get a permit to enter Turkey. For 45 days he had to be treated in a sterile room and underwent three surgeries to support his jaw which which he couldn´t use anymore. His father Zahid borrowed 5000$ for the operation as no aid organiszation were giving them funding. Another operation was scheduled for 25, August 2014 but had to be chancelled because there was no money. The family of six is paying 250$ rent for a flat in a building in Kah al-Reem which was empty before the war. Zahid the father works in the local Kuskus plant for the last 15 years and is supported by the owner of the factory. He earns 350$ a month. They get some help from the UNHCR but not on a regular base. The children are not attending school since they fled to Lebanon in June 2014.Kah al-Reem, Beka´a valley, Libanon. December 2014. 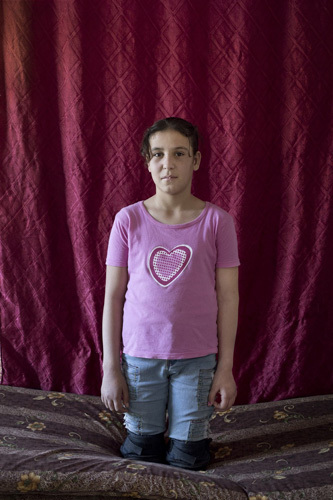 Marah al - Hamed, 12from Zaam in Dera´a province. Syrian army soldiers layed flammable substances in the neighborhood where she lived. They were detonated remotely and she was badly burned on her leg when she came home from school at 1pm on 18, January 2013.She was brought to a local provisional clinic where she was bandaged and stayed for five days.From there she tranfered to Zaatari refugee camp in Jordan and went through three hospitals before being finally treated in Dleil Hospital in al-Mafraq.for 10 days. Afterwards her dressing had to be changed every other day during a three month period. She still has a lot of pain and her father drove her to the school in wheelbarrow for three month. She is need for another plastical surgery. Zaatari refugee camp, Jordan, May 2014. Malik al-Misri, 5He was injured on 26, February during an attack by a mutiple rocket launcher of the Syrain army on the city of Daa´al 15km North of Dera´a. Four other children were lightly injured in the explosion of the rocket though his uncle Ala´a al-Misri, 21 died. 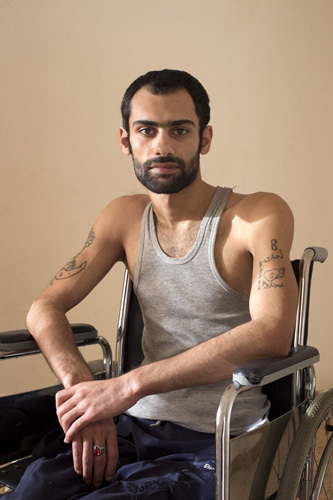 Malik received first treatment in a field hospital in Dera´a were he was brought to by the FSA in a normal car. 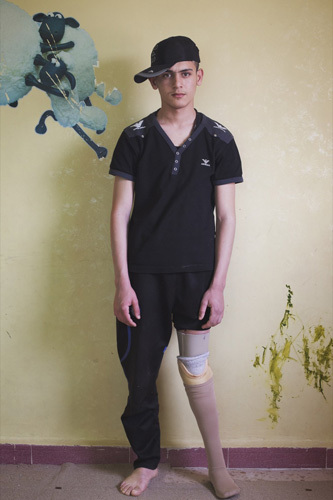 He was transfered to the Zaatari camp in Jordan where he was operated on the stomach, his femur and his leg nerve. Three pieces of sharpnel were removed by French doctors. Than he was transfered to the Italian Hospital in Amman where he underwent further surgerary the last onc in August 2013. Since he is in physiotherapy with Syria Cross Borders. His movement in his foot is slowly coming back. Before he was a calm child but became super active after the injury healed. For 7 months he had to be carried around by his father Mutas, 33 who worked as a taxi driver before the revolution. They are a family of two boys, one girl and his wife is pregnant. They stay in Jordan for the treatment of Malik with the help of a Palestinain who collects money from Golfstates and helps Syrian refugees in Jordan. They pay for the appartment 175JD and the hospital treatment. 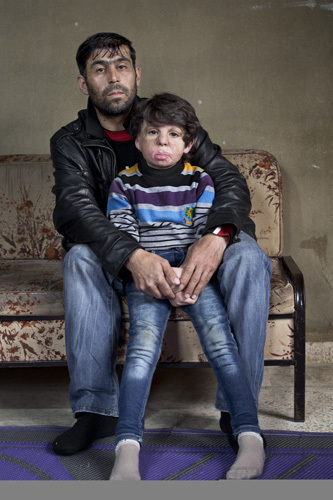 His father doesn´t know if he will go back to Syria it depends on the local situation there. His wider family is still there. The Syrian army layed a siege on the town with 5 checkpoints but was forced to withdraw by the FSA. The town is free now but the first army checkpoint is just 5km away. Amman, Jordan, 2014. Naghm Mahamid, 17 from Dera´a center.She was injured in the late afternoon of 24, April 2013 in her home which was hit by a rocket. Her mother died in explosion. 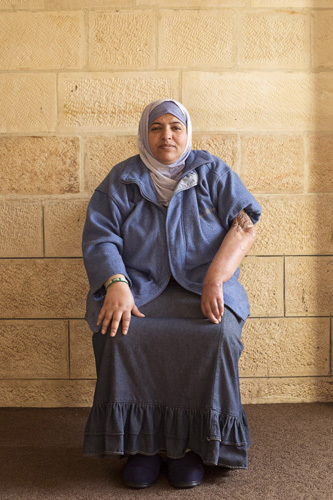 Naghm was brought to a provisonal clinic of the Free Syrian Army than she was transfered to Ramtha in Jordan.She was pregnant and lost her child as well as her lower right leg. Also her right elbow was scattered and she has shrapnel in her eyes which needs to be removed. After five days in Ramtha she was transfered to al-Jasira Hospital in Amman where she stayed for four months. Her husband Mohammed al-Hur followed her to Amman and sleep in th mosque of the hospital as he couldn´t afford to rent a place there. After they moved to Ramtha where she got physiotherapy for three months at the Taqaful Society an Islamic charity.They rented a flat for 175JD a month where they live now with six relatives. 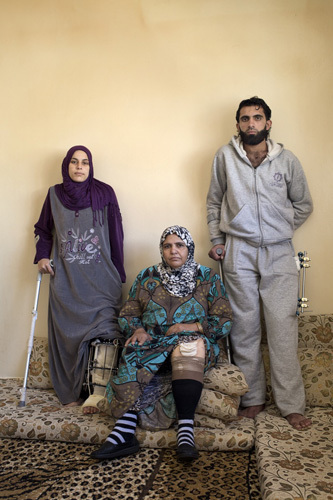 Mohammeds mother and sister were injured in a separate indident.Ramtha, Jordan, May2014. Sundus Hauwarnah, 11 from Jasim in Dera´a Province. She lost her left eye when two barrel bombs where dropped on her home town on 19, December 2013. Her whole family mother, father and three brothers were killed. All together 17 people were killed in the bombing also the whole family of her uncle vanished in the attack. She was transfered to Yarmuk Hospital in Ramtha/Jordan and from there to the Islamic Hospital in Amman. There Sundus was operated on the eye. All the muscles around it work well. Now she needs an artificial eye and plastic surgery around it.Sundus stayed there for a week and was than registered in Zaatari Refugee Camp from where she went to relatives in the Palestinian refugee camp al-Husn. Now her aunt Amal who lives in Shajara village takes care of her since two months. They are 11 people and pay 200Euro rent. Till a week before the air raid Sundus went to school and is back in school since the end of January. Shajara village, Jordan, May 2014. Salam Mohammed al-Jundi, 13a schoolgirl from Nawa in Dera´a province. 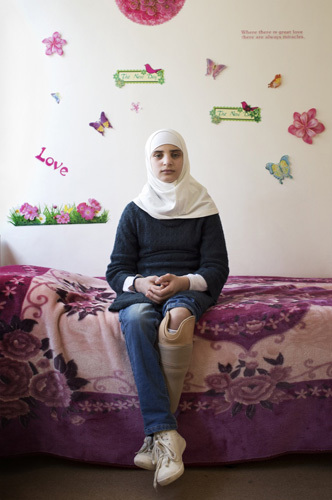 She was injured in March 2014 by a barrel bomb when she was on the way to buy a basketball cap as a gift for her 15 year old sister Fatemeh. She was walking between a parked car and a wall when the bomb exploded. Many people were injured her cousine Bisan Kanakri, 10 was killed. The explosion smash Salam between the car and the wall. Her right leg was completely smashed and peppered with srapnel. It had to be amputated below the knee, which is not functioning anymore. She was brought to a provisional clinic in Tafas for an hour together with her little brother Abdel Aziz, 8 who was injured too. Than she was transported to Ramtha Hospital in Jordan and from there straight to Maqassed Hospital in Amman where she stayed for three months.. She had about 7-10 operation there but can´t remember exactly how many. When she left the hospital she moved for two weeks to her uncle who lived in Zaatari Refugee Camp. In July 2014 she became a physiotherapy patient in the rehabilitation center of Souriat Across Borders an NGO in Amman. 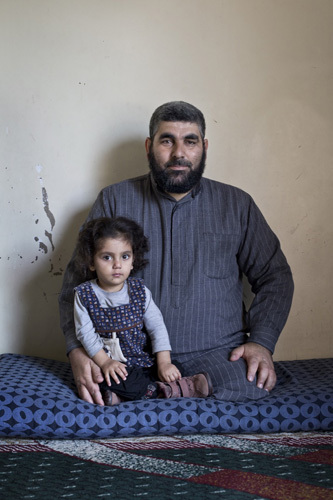 Her father and mother are still in Syria, the latter was very heavily injured in the head after the incident. She was transfered to Israel and treated there. In the meantime she is in better shape and back in Syria. Salam has no knowledge of what happend with her mother. Her father worked as a construction worker and Salam has four brothers and seven sisters. Salam haven´t been to school for three years, next Sunday 8, February 2015 will be her first day back in school again.It is doubtful she will ever walk again with the help of an artifical limb. In the moment she walks with a crutch.